Let Talking Shapes Teach Your Child to Read! The program is intended for Preschool and Kindergarten age kids that are interested in learning how to read. As you can see, there are seven books. These books have stories in them that teach your child the letter shapes and sounds. By the end of book seven, your child will have learned al 40 speech sounds in the English language. To begin, you just click on the first book, called The Fat Cat. In this first book, you are taken back in time and there are two girls, whom are sisters. You are in a time “long, long ago, before people could write”. These two sisters, Pat and Nat, loved to tell stories. However, because they didn’t have a way to write down their stories, they would sometimes forget them. They wanted a way to record them so they could read them over and over. So, they figure out a way to write down the words they say by breaking down each word into a drawing. They decide to call each drawing a “letter” and the whole bunch of drawings and “alphabet”. They start with the letter C and continue on with the rest. The first three letter the “invent” are c, a, and t, so they can spell the word, “cat”. 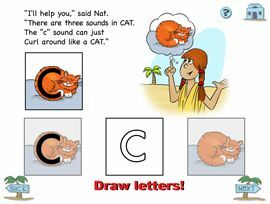 With each new letter, the girls teach your student how to write the letter using the shape of the drawing to remember how the letter is written. Very quickly, your child will be spelling words with these shapes. Talking Shapes builds confidence in reading because they are learning words right off the bat! I like that Talking Shapes engages the right and left brain of the student. And that your child will be reading within a few minutes of starting the program. I just love the creativity of how the letters are embedded into a picture of something. I also think it’s great that the student will know all 40 speech sounds and the letters that correspond to them by the time they get to the end of book seven. It makes learning the alphabet and speech sounds FUN! My daughter liked the animation quite a bit. She was giggling through certain parts. We had problems logging in to the program a few times. I’m not sure if that was a problem with our computer or the program, but either way it was a bit frustrating. When my daughter was supposed the be drawing the letter, sometimes it was a bit finicky. She would not even be finished tracing the letter and the program would finish it for her. That was frustrating for both of us. The program doesn’t seem to have a clear starting and stopping point. We did all of book one on the first day, because the program never told us to stop. I would love it if it would separate the lessons out in to daily activities. After that first lesson, she and I just tried to find a good stopping point. When we logged back in the next day, it would start her off where she left off. So, that was nice that it saved her place. My daughter is actually a little old for this program, but has struggled to read. With the help of this program, she has improved quite a bit! I do recommend Talking Shapes for kids in Preschool and Kindergarten or struggling readers.